- instructions about how to provide performance evaluations for employees in non-licensed roles through EDFS (Guild members, custodians, managerial employees and others). - a list of performance evaluation deadlines for each union/job classification, and information about whether or not employee’s step increases are contingent on an acceptable performance evaluation rating. You can also access this list and all performance evaluation forms by clicking on this link that will bring you to the circulars on the BPS website: evaluation forms and deadlines. Please submit completed, signed evaluation forms to Deborah Pullen, Office of Human Resources. Final evaluation ratings should be entered online. Please note: managerial employees must have evaluations submitted to HR and online by the June 1st deadline in order to receive a step increase for July 1st. By following the simple steps outlined in the document below, eval.mybps.org will run more smoothly and quickly on your computer! 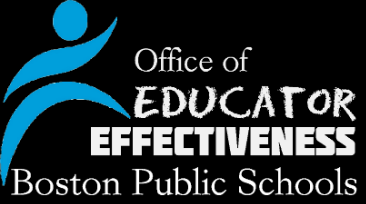 take the office of educator effectiveness survey! Your feedback is very valuable – thank you for your time! The deadline for completing the survey is Friday, April 26th. Last year, over 300 teachers weighed in on PD, teacher leadership, and special education during the Superintendent + Teacher Share Series -­- and the district is implementing recommendations you made. Join Teach Plus and Superintendent Carol Johnson Monday, May 6th as we celebrate Teacher Appreciation Week with a discussion about supporting teachers on the Common Core/MA Curriculum Frameworks and evaluation. Dr. Johnson and fellow district leaders are eager to hear from you. An administrator within BPS has developed this document to help streamline the formative assessment process. You may find it helpful as you continue to write formative for educators at your schools. The documents below provide a crosswalk from previous BPS performance evaluation criteria to the new Standards and Indicators of Effective Teaching and Administrator Practice. BPS Performance Evaluation in the news! An article in the February 17, 2013 Boston Globe describes implementation efforts in Boston. Sangalang, an accomplished teacher...finds the feedback useful. After the most recent session, Lineweaver dropped a note in Sangalang’s mailbox, offering feedback and requesting an update on the lesson. Eval tips for the month of February are now available! In this edition, you'll find information on what goes into a formative assessment, tips around letting artifact rationales work for you, features of the all new meetings tab, and guidelines around using video artifacts. Please read here about all the latest updates to EDFS! Introducing the Eval Tips of the Month Poster. January's poster provides tips on preparing artifacts for the formative assessments that many educators will receive in the coming weeks and month. Hang it up on the wall or share it with your colleagues.